Iceland is full of unfiltered adventure. From the glaciers to the volcanoes, waterfalls, mountains and so much more. Here's why you need to keep going to this incredible country again, and again. Our very first VoyEdge RX tour to Iceland has been back for about two weeks, and I'm still recovering from all the incredible moments we had together in Iceland. First and foremost, I'd like to give a huge shout out to all 21 of our customers who booked this tour with us. It wasn't easy to plan, it took a lot of work, but all the logistics, pricing, transfers and drop-ins worked out perfectly, so thank you to all of our partners and vendors also! As you have probably started hearing, Iceland is full of adventure. Reykjavik is lively, and the whole country of 340,000 people is completely untapped when it comes to tourism. Well, kind of. Over 2 million tourists flocked to Iceland from around the globe last year (they have a counter at the airport, actually) and Iceland is still adapting to the droves of tourists who are coming to see this incredible country. No doubt in my mind that due to the Iceland CrossFit scene, Game of Throne's, and our ever-more connected world, all three have really put Iceland on the map as a must-see destination to go to in your lifetime. And I couldn't agree more, so I'm going to digest a few things about why I think you need to come and see this majestic country, over and over again. Reykjavik is the capital city of Iceland, and without a doubt is much more vibrant than you could ever expect. An obvious port and shipping town, Reykjavik now boasts majority of the population of Iceland, and has more restaurants, bars and museums to see than you could ask for in a week. Seriously, there's a lot of things to do, and whether or not you love shopping, drinking, or eating, you're going to be in great hands. Not to mention, the food trucks, art scene, outdoor sculptures, Hallgrimskirja Church, cafes and the seaport area are all must-sees. And the best part? It's all entirely walkable. You can walk across the entire town in about 45 minutes in either direction and is easily navigable, with the tallest buildings next to the water, close to the Sun Voyager statue. Plus, in the summer, the bars (which all have wheel of fortune games within them) are open till about 4 pm and are never too crowded. The beers however, can be upwards of about $10 US dollars, so you better find those happy hours, where they are between $5 and $7. Oh, and the food is world class....try the horse steak, shark, and mink whale. Trust me, it will give you something to Instagram and to talk about for years to come. Another must do if you're headed to Iceland is to see the Golden Circle & Southern Coast of Iceland. And if you've got to choose between the two tours, I'd say go for the Southern Coast, for sure. Here's why. The Black San Beaches, Skogafoss, Seljalandsfoss Waterfall, Crashed DC-3 airplane and the town of Vik (in my book) are a must. Located about two hours away from Reykjavik, the drive is well worth it for this completely foreign-looking world. Let's start with the waterfalls first. 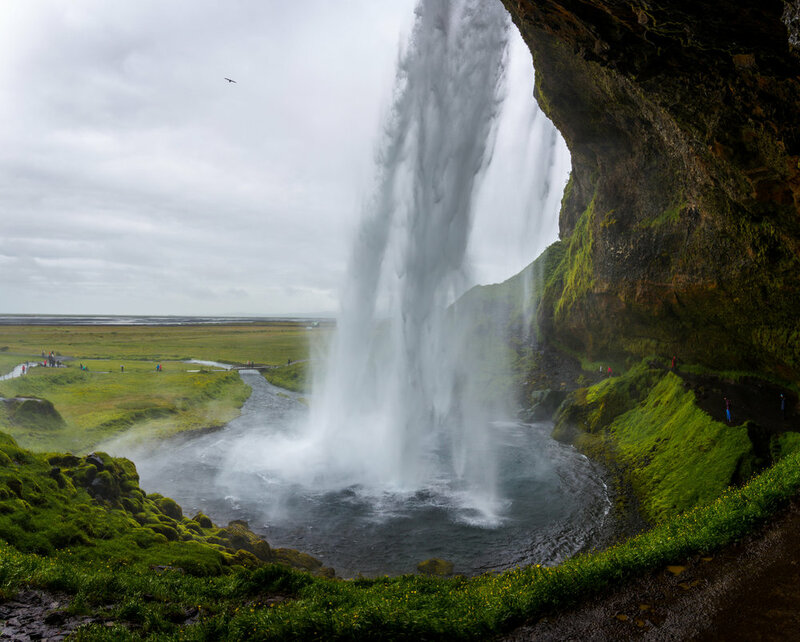 The Seljalandsfoss Waterfall is the first thing you'll see when you come towards the South Coast of Iceland. And it's the one where you can literally walk behind it (please do) and you can really get the feel for just how powerful this waterfall is. You'll get wet, for sure, but you'll appreciate nature in a whole new way. The waterfall itself comes straight from a glacier high up in the mountains and runs year-round. Next up, you'll pass the might Skogafoss Waterfall on your left hand side while continuing your drive down the Southern Coast. This majestic waterfall is probably the more popular of the two, and for good reason. Boasting a 60 meter high descent, this waterfall is directly fed from the same glacier that runs the Seljalandsfoss waterfall, and with a 300+ staircase leading up behind it, you're definitely going to want to venture up and get a magnificent view of it. And without a doubt, from the moment you drive into the parking lot, till your climb up, you're going to get a perspective of just how powerful nature is, and can be. Make sure to take your Nalgene bottle and fill up with some crystal clear glacier water. You'll be happy you did, it's amazing. You can also camp out here near the parking lot if you want, or are driving around the country on your own. I'd highly recommend it! Next up, if you continue your drive down the road from Skogafoss, you'll find a medium-sized parking lot with a few cars and nothing around for what looks like miles. Alas, you've found the parking lot to walk to the crashed DC-3 airplane in Iceland. The story goes...in the 1970's a U.S. Navy DC-3 was off the coast of Iceland on a practice mission when the pilot began to lose power and receiving signals the plane was losing fuel by the second. While maneuvering back to the coast, the DC-3 swiftly lost altitude and the pilot began preparing the 22-person military plane for a crash landing on the black sand beach. The pilot nearly lost full control of the plane over the water, but managed to get onto the beach by a few hundred meters, narrowly missing the icy-cold waves on the Southern Coast. Luckily, no one was injured and all 22 people suffered minor injuries, but escaped the harrowing scenario with their lives. Come to find out, the DC-3 was working just fine, and it was due to pilot error and misreading of several of the onboard instruments that led the pilot to believe they were losing fuel, power, and led to the crash landing. Long story short, the plane has become an iconic attraction for anyone visiting the South Coast, and the 2+ mile walk from the parking lot to the plane was well worth it. Even if it is raining sideways and took us nearly 45 minutes to get to it. Naturally, after getting there, we took the whitest photo of all time, throwing up gang signs and posing for what could easily be a rap album cover photo. Long story short, visit the plane. It's super cool and an even better story. Next up on the Southern Coast tour is a couple of overlook spots, about 30 more minutes away from the plane's parking lot. Drive up to the top of the mountain and get some incredible views like this of the Black Sand Beaches and Southern Coast. It's pretty damn remarkable to see that much land go completely untouched. Side note, I was really just blown away at how black and green the landscape was. The below photo captures my astonishment perfectly. Iceland is seriously, SERIOUSLY, underrated and otherworldly. The last stop on our Southern Coast tour, was the town of Vik and the Black Sand Beaches near Dyrhólaey. An absolute must-see (yes, again) if you're down this way. The arch, and beaches in this area are Game of Throne's film locations (Where Daenaerys' Castle is at Dragonstone) and is a marquee spot to forever remember. Plus, some of the waves coming in WERE MASSIVE. You couldn't pay me to jump in that terrifying ocean. This beach is what spawns nightmares for years. I'm sure of it. Side note about the town of Vik. Vik is famous for a lot of things. Mostly for the eroding coastline. Every year, about 50 meters of beach is getting washed away, and even the mountains are eroding at a blistering pace. I am not entirely sure if it's due to climate change, or simply the water guzzling the sandy black sand beaches at a blitzkrieg pace. Go to Vik, and chat with the shopkeepers about it. They will tell you some incredible stories of boulders falling off mountains and narrowly missing cars, or sheets of ice cascading down the mountains towards the village. Wild stuff, man. And now, finally....The Golden Circle. Thingvellir National Park is the site of the oldest Parliament in the world. When Iceland finally begin coming together after the age of Vikings, many tribesmen and their clans followed them to the site of the continental divide at Thingvellir National Park. Close to the year 1,000 many Icelandic tribesmen settled and agreed on a constitution to set forth a united Iceland. And for hundreds of years, Iceland was united, fought off several territorial invaders, was conquered by the Nords, then again by the King of Denmark, then fought off tyranny several more times to get independence again. The stories of Thingvellir National Park are wild, and deep, and are truly the stuff of legends. I'd highly recommend doing the tour and getting a full history lesson of this magnificent place. Next up on the Golden Circle tour, was the mighty Gulfoss Waterfall. I've never seen power quite like this waterfall, and in late 2017, Iceland will actually be building a hydro power station built using the Gulfoss Waterfall as its power source. For now, I'd highly suggest going there whenever you can and walking the steps. The sights, sounds, and water itself will leave you in pure awe and astonishment. Plus, it makes for some amazing photo opportunities. Also, make sure to hit up the Strokkur Geysir...it erupts every 5-10 minutes and is almost always part of every Golden Circle tour. It's well worth it! If you're going to Iceland, please make some time to find and book some random activities. Iceland (as expensive as it can be) is well worth the price. The hospitality, cleanliness and peace of mind you'll get from visiting some of the 'off the beaten path' places will be well worth it. The above photo was taken from one of our days at the 'Secret Lagoon' located about an hour and a half west of Iceland. Definitely take some time to find an adventure that sparks your interest and go for it! Plus, if you have time, please PLEASE take some time and go see a glacier in real life. The Eyjafjallajökull (betcha can't say that word) glacier is pretty amazing. As it grows in the winter, it retreats in the summer, leaving behind a 600 foot deep lake just feet away. And while it's off the Southern Coast tour, you can spend a day and actually hike up to it. That's something we'll definitely do on a future winter tour. The Blue Lagoon does not land on the 'off the beaten path' list of places to go or see, but I will tell you, it is a must. At a steep daily cost of $90, you certainly get what you pay for, but there is truly no better way to cap off a trip to Iceland than by stopping at this amazing geothermal spa. You'll get handed a towel, an RFID bracelet and will have free roam of this incredible and amazing landscape. Even though it's only 3-4 feet high, you'll be able to enjoy everything from all natural face masks, to beard treatments, and can even drink in the pools themselves. With Iceland being such a hot spot for geothermal activity, the entire country has found an ingenious and seriously unique way to enjoy themselves and provide some of the world's most unique attractions to visitors from all over. Plus, with the Blue Lagoon (named for it's obvious hue) being so close to the airport, there's no better way to prepare for an afternoon departure back from than by stopping at the Blue Lagoon. I can tell you, we're 100% going to make this a pit stop on the way back to the airport for each and every VoyEdge RX tour. It's so worth it. During our VoyEdge RX trip in July 2017, we worked closely with CrossFit Reykjavik to allow all 21 of our fantastic customers to be able to drop-in. And if you didn't know, CF Reykjavik is home to 2x CrossFit Game's Champion, Annie Thorisdottir. While Annie wasn't there, (already in Madison for the CrossFit Games) we were taken care of by CFR's AMAZING staff and dedicated coaches. They even taught the classes in both English and Icelandic for us, and allowed us to drop-in as early, or as late as we wanted to. And in the back, they had hot and cold spa treatments, separate stretching rooms, always enough room for open gym, or Oly work. Oh, and don't forget...the programming was world class....all of those workouts during the week kicked our asses! Thanks for the fitness CrossFit Reykjavik! We can't WAIT to be back! Look, I could continue this blog post for a long time. Iceland just has so much to offer. And whether you go in the summer, the winter (I've heard the weather is actually better than Boston's during the winter months) you'll have plenty to do. From the artists-haven of Reykjavik, or the incredible Southern Coast, the glaciers, volcanoes, ATV'ing, caving, sightseeing and so much more, you just won't be bored. Iceland is truly the place of dreams and I can't wait until we lead our next tour there. It's a life-changing place, and I think everyone should travel here and see the natural beauty that Iceland holds. Not to mention, Icelandic people are some of the most caring, and hospitable people in the world. Can't wait to get back there. Have questions? Want to go to Iceland or want some more information? Email me at: cam@voyedgeRX.com or see the next few tours down below on our trip calendar. Please also don't forget to hit the 'heart' button down below and share this blog post!